Brütal Legend is an action-adventure game created by Double Fine Productions and published by Electronic Arts for the PlayStation 3 and Xbox 360 The game was released on October 13, 2009 (stylised 'Rocktober 13' in promotional material) in North America and on October 16, 2009 in Europe. Though Brütal Legend was originally to be published by Vivendi Games prior to its merger with Activision, Activision had dropped the game from its portfolio after the merger. It was later picked up by Electronic Arts, though Activision and Double Fine brought counter-lawsuits against each other over publishing issues. The issues have since been settled out of court. 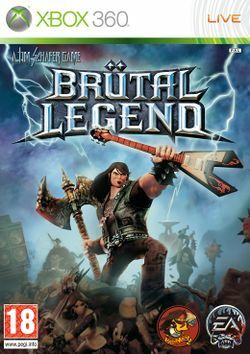 Brütal Legend follows the story of Eddie Riggs (voiced by Jack Black and named after Eddie the Head, the mascot of Iron Maiden, and Derek Riggs, the artist who created Eddie), who is the world's best roadie for the world's worst "heavy metal" band, Kabbage Boy. The game begins one night during a gig. When the lead guitarist falls from a part of the set, constructed by Riggs, Eddie catches him, but the piece of scenery breaks off and lands on top of Eddie. His blood drips onto his cursed belt buckle, which is really an amulet for Ormagöden, "The Fire Beast, Cremator of the Sky, and Destroyer of the Ancient World". Ormagöden awakens, kills the members of Kabbage Boy, and transports Eddie into a heavy metal and Nordic fantasy inspired alternate history where demons have enslaved humanity. Eddie comes to learn that the fantasy world was created by a race of ancient Titans who left numerous relics and instructions for the following generations behind for them to use to build upon, but neither humans nor demons could decipher their meanings. Only Eddie, due to his roadie skills, is able to make sense of their meanings and can put the Titans' wisdom to use. While Eddie is seen as the "chosen one", it is unclear whether he is the savior or the destroyer of the world. This page was last edited on 30 May 2016, at 05:03.